Early '70s French psych-rock here, not so much on the proto-metal side of things but still totally groovy, and from the get-go not failing to rock the cowbell (well, the opening track on this 22 song collection, "Peut-etre Demain", is the number one cowbell culprit, gotta love it). Wakhevitch was an avant-garde, electronic composer whose first few albums enlisted the fuzzed guitars of Triangle as part of their surreal soundscapes. So we'd been always curious to hear Triangle's own music. Of course it's not as far out as the Wakhevitch stuff, they're basically a pop band, tres commercial, yet with a freaky side to 'em. This disc, as the title reveals, collects some of their crucial cuts from '69 through '74... a lot of upbeat numbers with DJ-friendly beats, symphonic prog moves, catchy choruses, and swingin' horns. 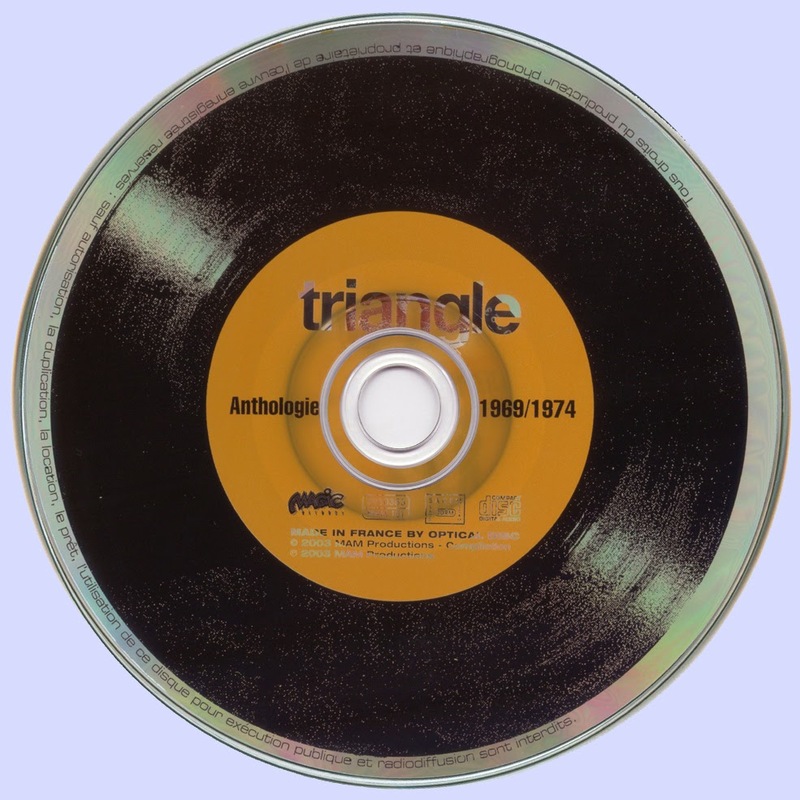 Really, judging from this disc, Triangle were all over the place, from synth-laced proto-disco to placid piano ballads to bubblegum hard rock. If you like stuff of the "B-music" persuasion (like the Prog Is Not A Four Letter Word comp), or that Total Freakout collection on Mucho Gusto, or rad '70s "library music" and things like that, we figure you'll dig these Triangle tunes. 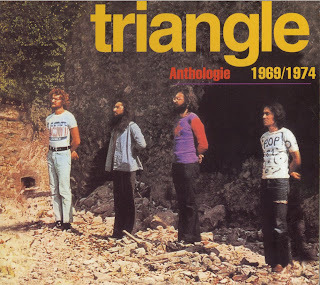 This digipack includes pictures of all of Triangle's original 33 and 45 rpm record sleeves, which are nice to have -- the first album's got a piano engulfed in flames on it, the second has Triangle lined up for a firing squad, also comprised of the band members. But there's no liner notes to speak of, so we don't know a heck of a lot more about 'em, other than that they recorded three albums and a bunch of singles, had some hits, went on to back up pop singer Papillon on a solo LP of his (three tracks from that album, including their cover of Bowie's "Starman" en Francais, are to be found here).